Following on from the exciting recent news that Big Finish, best known for their extensive range of "Doctor Who" audio dramas, will be producing original "Prisoner" audio dramas to be released in January 2016, The Unmutual Website is delighted to announce that executive producer and writer of the dramas, Nick Briggs, has been kind enough to spare some time on several occasions to give a few more details regarding his plans for the series. Nick's interviews for series one of the audio series are reproduced below. 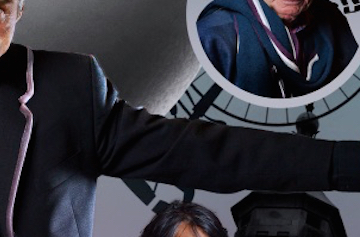 For more recent interviews (series 2 onwards) click HERE, for news as it is announced regarding the Big Finish version of 'The Prisoner', keep an eye on the main news page HERE, and click HERE for a special photo report. 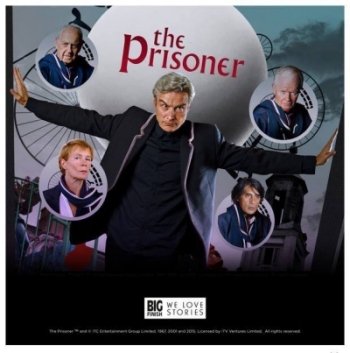 TUW: Thanks for speaking with The Unmutual Website today, can I start by asking when you first felt that The Prisoner would be something that you and Big Finish would like to do? I know you've been a fan of The Prisoner for nearly 40 years…. Nick: I’m not exactly sure when I first thought about it. The Prisoner is something I’ve loved since I first saw it in 1977, so we probably would have discussed it at various Big Finish meetings since 1999. I started having meetings with ITV about five or so years ago about a number of possible licences, and I certainly mentioned The Prisoner at that stage. TUW: There have been various book spin-offs, and the 2009 TV remake. How did you feel about those yourself, have you read/seen them and have they influenced your approach to the audios at all? The general feeling is that they have not been a huge success…. Nick: I haven’t read the books and I am only vaguely aware of the graphic novel. I saw the TV remake. I don’t think it’s for me to pronounce judgement on anything, and I certainly don’t think my view on a book or a TV series is of any more worth than the next person’s. But I will say this… I have never met anyone who expressed any liking for the TV remake. In the interests of fairness, I should perhaps say that I was very excited about it at the time of watching it. I watched it all in one sitting. I’m a big fan of Hayley Atwell’s work. And, rather sadly perhaps, I liked the fact that they used some of the old sound effects from the original. But… well, I’ve never watched it again. And I’m certainly not planning on consciously using any of the elements of it in this new, audio version. TUW: So much of the content of the 17 episodes is visual and allegorical, how do you attempt to capture this, if at all, in the audio series? Nick: If you know my work for Big Finish, you will know that I have always been a great believer in anything being possible on audio — even the most apparently ‘visual’ things. It’s the medium I work in most and I, perhaps immodestly, feel I have developed or evolved an ‘audio translation interface’ in my brain. Anything can be re-imagined for audio. You just have to come at it from a slightly different angle and find good reasons for people to talk about things and not say things like, ‘Oh my goodness, is that a large white balloon thing bouncing across the beach towards me?’ It really makes you evaluate what the important ideas and plot elements are. It also makes you concentrate on character too, because you really have to know your characters inside-out to make sure they don’t just say things for the ‘convenience’ of describing something visually. There always has to be a good reason relating to character. TUW: How far into the process have you got so far, have any stories been written and has casting begun? Nick: I’ll let you into a secret, I started writing the first script before the licence agreement was signed with ITV. I just couldn’t resist. And I thought to myself, Well, if this doesn’t actually happen, at least I’ll’ve had some fun doing this. But the way I often work is to write about 20 minutes of script to get myself going. Then I go back and write the plot, usually rewriting that first twenty minutes. That’s what I’ve done now. And I’ve also moved ahead and written the detailed plot-lines for the first four episodes — the first box set. So I’ve nearly finished the first script and the other storylines are there, in detail, for me to start work on. I have masses of casting ideas for the various Number 2s. I’ve also narrowed down my list on Number Six. No one has been cast yet. I’ve been having meetings… let’s leave it at that for now. Except to say that I really think it’s best if the new Number Six is not a star or household name. It just needs to be someone who can immerse themselves in the part — not that a star name couldn’t do that — but I’m not keen on a ‘star persona’ getting in the way of Number Six. TUW: Will the Number Six character be the same character as played by Patrick McGoohan? Nick: Essentially, yes. The way I’m writing it is entirely based on my interpretation of that character as created by Patrick McGoohan. And then that interpretation will be taken by an actor and uniquely interpreted by him. So, I would say, perhaps not absolutely everyone is going to entirely recognise it as ‘their’ view of Number Six — but hopefully it will be near enough for most people to be able to identify with it. What I’m essentially saying is that I’m not intending to make any huge changes to the character. He will be a man. He will be tough and determined. He will kick against authority and he will refuse to give in. He will have that anti-hero feel about him. If Patrick McGoohan were still alive and the right age, I’d beg him to play it. Nick: No. Not an impersonation. I think that would be a bit daft and unrewarding. Your analogy of the James Bond franchise is a good one, I think. I’m not even particularly interested in a different style or approach, though. I want the actor I cast to boil down exactly what McGoohan’s approach and style was and then for them to do that their way. Patrick McGoohan’s performance is an extraordinary landmark in TV history. He was utterly brilliant and unique. I don’t want to copy him, but I want us to do our best to tread boldly in his incredible footsteps. We shall aspire to his energy and attack. My hope is that as we aspire, we will create something unique of our own and that it will be something worthy enough to co-exist with the original, brilliant series. TUW: The overwhelming reaction is that this project is in the best hands with Big Finish, but there have been a couple of doubters. What message would you have for more sceptical folk? Nick: As I said on Facebook the other day, I completely understand the doubts people have. I would have them were I not in the position I am in. I’m too excited to have any major doubts. That’s just the way I am. It’s not confidence, it’s just that when I engage in a project, I give it my all and it means everything to me. 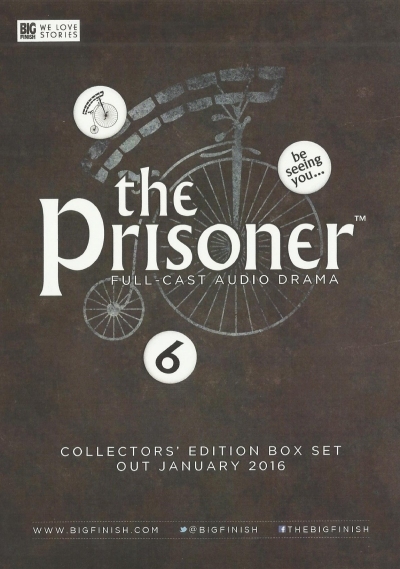 All I can say is that I bring all my genuine, heartfelt love of The Prisoner to this new, audio series. My intention is to make something great that will entertain and engage fans of the original as well as people who are new to it. This is only possible because of the brilliance of the original. There is no way I can eclipse or get near to that; which is why I think audio is the best way of doing it. It’s so different from television. It’s a new way of telling the stories we already know and of telling new ones too. TUW: And finally, any hints or anything you can share with us at this stage? Nick: My intention is not to slavishly reproduce the original series. There would be no point in that. You can watch the original any time you like — as indeed I do, very often. This is a re-imagining, but a re-imagining that is firmly rooted in the original. I want people to imagine all the iconography of the original series. The look of it on the packaging will be very recognisable as the original series. But this won’t be a carbon copy. Perhaps, and I am stressing ‘perhaps’, think of this as something from an impossible, alternative universe where The Prisoner was made as an audio series instead. It’s got all the same ideas, motivations and aims, it’s just that you have to see them in your mind’s eye with the help of some top notch acting, sound design and music. My intention is for it not to have the same music, but for the music to sound as if it came from that particular era on television, as if it were being played by the same ‘band’, as it were — I love that music! It’s The Prisoner, viewed through a slightly altering prism, but in a way that hopefully gets to the root of the spirit of the original. I want to get as near as possible to giving people the feeling of ‘seeing’ it again for the first time. I’m not going to mess with it and mess it up. I’m not going to contradict anything essential or give boring, obvious explanations for things best left as mysteries. I want it to be fun, serious, thought-provoking, tense, exciting and challenging. Inevitably, I won’t be able to take everyone who loves The Prisoner with me on this journey, I know that. I just hope that enough of you will join in and love it too, so that our journey can continue for many years to come. TUW: How difficult was it to write the two 'new' episodes; 'Departure and Arrival' and 'Your Beautiful Village'? Nick: The third episode, ‘Your Beautiful Village’ is the only wholly original one. ‘Departure and Arrival’ is largely based on ‘Arrival’ from the original series. I think listeners will recognise many key elements from the source material in that one, including a number of much-loved lines. ‘Your Beautiful Village’ is an attempt to exploit the audio medium to the fullest. The sense deprivation takes us very much into Number Six’s personal struggle and I wanted to give the feeling of how close to breaking point the Village’s techniques can bring him. As for how difficult, that’s actually difficult to answer. In a way, in my view, all writing is difficult. But when it’s difficult, you get your head down, get into the zone and work as hard as you can until it gets easy. I think all writers battle to some extent with the ‘empty page’. But I always plan everything out, so by the time I come to the script, there’s a meticulous route map. I can still take interesting detours, but I’m always sure of where I’m going. TUW: Why you chose those 2 existing episodes ('Chimes' and 'Schizoid Man') to base the other two on? As you know, there are all sorts of proposed orders for the original episodes. There’s the broadcast order, the production order and a number of ordering ideas suggested by those who’ve carefully gone through all the episodes and worked out which bits of information would logically have been introduced at which point. I don’t think any of these orders are unquestionably definitive. One such ordering suggests ‘Schizoid Man’ as the second episode. Another suggests ‘The Chimes of Big Ben’, so I thought I’d tackle these first. ‘Big Ben’ is a personal favourite of mine, because it was actually the first one I saw, but I was also drawn towards the challenge of how to do ‘Schizoid Man’ on audio. Think about it. It really is quite a challenge, having a double of Number Six on audio! You can’t even see the moustache! But I think I’ve found a rather fun way to make it work. Of course, the listeners will be the ultimate judge on that, but my hope is that it’ll make for very exciting, intriguing listening. Great to see casting announced and the new audio trailer online soon, is it a big relief to get this stuff out there after all the months and years of preparing the series? We haven’t announced anyone, but we’ve set some clues as to the casting, with the artwork. So it’s still a bit of a tease. It’s not so much a relief, but it’s exciting. Lots of anticipation. I just hope people like it. How did the recording sessions for the episodes go? It was all a mixture of hard work and great fun. We’ve got some really lovely casts and our Number Six is superb. He knows and loves the series and threw everything into it. Has it been a challenge, through sound and music, to get 'The Prisoner', such a visual series in many ways, across in audio form? 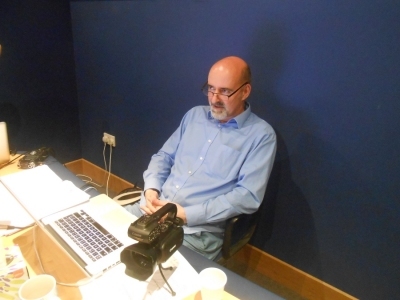 I’ve worked really closely with our sound designer, Iain Meadows, and our composer/sound designer Jamie Robertson. I’m really pleased with the authentic feel we’ve got to the series. Authentic, but with a twist of something new. Not many people will know Mark, what will he bring to the role of Number Six? He's a great actor. He has an incredible intensity and energy. He’s very aware of Patrick McGoohan’s performance. He isn’t doing an impersonation of it, but he’s got elements of that anti-heroic charisma. He was amazing to work with. It’s a very dominant performance which really draws you in. Some great names have joined the cast, including some wonderful Number Twos, had you had them in mind for the role for some time? I had a long list of Number Twos in my mind, and we managed to get four of them here. It’s fascinating to see how they all bring something different to the part. I particularly enjoyed directing the more confrontational scenes between Six and Two.